After three and a half years and more than 380 entries we have reached the end of this journey through WWI and the end of Captain Hills Letters. We want to take this opportunity to thank you for your participation. We hope you have gained an insight into one mans experience of this terrible war through these incredible letters. A very special thank you to Lilian, the volunteer who tirelessly typed up all of these letters. Without her work this project wouldn’t have been possible. After the War John David Hills went to Oxford and read History. He became assistant Master at Eton in 1921 and was made Senior History Master from 1935 to 1939. While working at Eton he commanded the Eton OTC (Officer Training Corps) from 1930 to 1932. He was appointed Headmaster of Bradfield College in 1940 and held the post until 1955. He married Lady Rosemary Baring (elder daughter of the Second Earl of Cromer) in 1932 and they had one son and two daughters. Captain Hills retired to Wales and died aged 80 in 1975. Very many thanks for a host of letters. We work hard all the morning, repairing the ravages of war, and play games during the afternoon, leaving Orderly Room until the evening when there is enough work to terrify the bravest man. Lt. Col. Griffiths has got a D.S.O. – good for him, and we are all every pleased. Rugby football has started. Last Friday we had a sort of pick up performance in the Battalion. I turned out just to see how my knee would stand it. Finding that it stood very well I repeated the performance the following day. On Sunday a Brigade team was challenged by the 14th Tank Battalion and I was asked to play in my old place – left wing ¾. It was a grand game but they had played together often and we are only a scratch side. They won 5 pts. to 3 – i.e. a goal to a try. I ended up with my vest off and covered in bruises but it was simply great and I have not enjoyed myself so much for a long time. The knee stood it without a murmur. I shall now play at every possible opportunity. We have a new padre – one Walton by name. He arrived last night & plays Rugger so there is hope for him. Letters Dec. 4th & 6th no news. P.S. You may now add the letters M.C. after my name in future. 9740 SUPPLEMENT TO THE LONDON GAZETTE, 30 JULY, 1919. Capt. John David Hills, l/5th Bn. Leic. R., T.F. For conspicuous gallantry and devotion to duty. At Pontruet, on September 24th, 1918, after the battalion attack on this village, he went forward and helped in the reorganisation of the battalion, bringing back most valuable information. On September 29th, north of Bellenglise, in storming the Hindenburg Line he worked with untiring energy, and. his services were invaluable in reorganising the battalion after having taken their various objectives. Hills was also awarded the Croix de Guerre (with bronze star). As far as we can make out we are not going to journey over the Rhine. In some ways I am sorry as seeing new countries at the Government’s expense is always a sensible proceeding. However if it means that we shall be all the sooner in England we have nothing to complain about. We are at present in a very cold home – due to the fact that there is no glass in most of the windows: however we must not complain, as we have at least got a roof. The gloomy Colonel is rendered still more gloomy by a boil and now never says a word. H.Q. mess is like a funeral and I long to throw cups and plates about merely for the sake of making a noise. I am trying to bribe the Doctor to send him away. I suppose the war is now more or less at an end – at all events it is hardly likely that active hostilities will be resumed at the conclusion of the Armistice. There has been a marked lack of excitement about the finish, and all ranks are going about their daily jobs very quietly and contentedly. The only question that exercises our minds now is whether or no we are for Germany. Who is to be the Army of occupation? Everybody is asking. Personally I shall not mind a bit seeing some new country and I think most of the men are quite keen on seeing Boche land. You doubtless saw in the official communique a few days back that Leicestershire Troops captured a battery at the point of bayonet. It is good to think that this Battalion was about the last to be mentioned in a daily despatch – at all events we were fighting up to the bitter end. We are moving today out of our comfortable billets and shall probably be trekking for a day or two. However I expect we shall be more or less comfortably housed wherever we are. There ought to be no heed now to bivouac on a mud-heap. Time at last for a line or two to let you know how we are getting on. My journey as far as Folkestone was uneventful except that at Charing X. I came across Gen. Heathcote, who was formerly commanding the 4th Lincolnshires, and whom I knew very well. I had just got on to the boat when he came along and asked if I would like to go with him on another ship – taking the Japanese Prince – Gen H. was made O.C. Troops on board. Of course I went and we crossed in great comfort. I was expecting it to be rather rough but it was not. We had dinner together the other side, and by a great stroke of luck I managed to get a train on the same evening as far as Amiens where I arrived in the very small hours of the morning. I slept for 4 hours in the Y.M.C.A. Rest House and then came by road. I was very fortunate indeed and by begging lifts on lorries and cars managed to get up to the line. The line however was going forward so fast that I did not reach the Bn. Until early the following morning. I did not miss any fighting but only just arrived in time. Even then we have not had to do anything very terrific – merely chase out the rear guard. Now he has gone so far and so fast that we cannot catch him. I found Dunlop very miserable and unhappy, however I soon cheered things up a bit. The new C.O. is an Irishman (Green!). He is most very quiet and seldom commits a smile: he has not yet laughed. However we all live in hope. We have of course been liberating large numbers of civilians who are simply over joyed. Our recent billets are the height of luxury and we are more comfortable then we have been for years. The only fly in the ointment is that we never stay more than five minutes in any one place. The rain has not made things over pleasant for the people on outpost duties and those doing attacks – and roads are not unnaturally getting bad in places. The thoroughness with which the old Boche has blown up cross-roads and bridges has also made extra work for us. However we don’t greatly worry over little things like that. One cannot help admiring the Boche rear-guard tactics. Only once have we managed to catch him napping. In the mist two days ago, Ball got his Company well forward and surprised a Boche battery of 4 guns. We captured or killed all the horses – took over 20 prisoners and killed half a dozen gunners. It was impossible to hold the Battery so we damaged what we could. Wollaston is probably coming back to us thought I understand he is getting leave first. Do not be surprised or pained at the untoward appearance of this epistle. We are at war and that is an excuse for many things. The sun is shining – birds singing – hares running about, and I, having just shaved, am lazing under a bank in the sun. Incidentally we are in the middle of a battle. We have done so many lately that I for one have become most terribly blasé – it is a big battle and some of us had something to do with the start of it early this morning. Since then other people have being going on through us, and if they keep it up at their present rate of progress, we shall soon be left behind, out of earshot even of our own heavy guns, and they are usually a good way back. I have not been very well lately probably because for 3 days we slept in a house (first time since May) with a carpet and all sorts of awful civilized booby traps of that sort. However I am better now, in fact quite fit again. As a matter of fact my recent indisposition may quite well have been due to over eating. It has been extraordinarily interesting to see the changes in the country as we passed through. First the absolute desolation & ruin of the country which for more than a year – last winter – had been front line. Then came villages somewhat battered by artillery and too close to the Hindenberg line to be very pleasant. Then one day some cultivated land. Then – my battle because I was in command – a village still containing Civilians – Bochized since 1914 – underfed and bullied – taught to take their hats off to every soldier – afraid to smile. But still a village with many houses intact and consequently billets instead of bivouacs. Today these same down-trodden civilians are watching gangs of Boche prisoners march along their streets. I fear with considerable glee, and no little hatred to judge by the cries of “coupez la tete!”. They are having the time of their lives, and it does one’s heart good to see them. We got eight new officers yesterday but I hardly had time to look at them before moving off to this battle. I expect they will last for a week or two and then fade away for the winter. Banwell and I will remain and possibly one or two others who have managed to stick so far. Taylor, Dunlop and Argyle are quite useful examples. Ashdowne is on leave in town somewhere. Most of our wounded have managed to find their way to London. I dare say Dad has already seen one or two of them. This battle is really going extraordinarily well and the noise which at dawn was so terrific has now dwindled to a distant murmur in the East. I expect the old Boche will be well on his way to “evacuation” by now whether he likes it or no. I am not a “fire-eater” but I must say there is something very enjoyable about a battle which goes well. No time for more, I expect we shall pack up and go home soon. Very many thanks for several letters. There are several of the Rgt. about. Brooke & Sloper are both at P of W Hospital Marylebone. Col. Griffiths is at the Russian Hospital in S. Audley St. Do get Dad to go and see him – do go yourself – you will find him very refreshing & most cheerful. Give him my love and tell him he is dead sure of a D.S.O. I will come & see him when I get leave. Johnson is ours all right. Did Dad see Brooke? You said he was going to do so. Up to the present there is no sign of Col. Wood but I expect him back any minute – we need him very badly. Petch will probably be home soon, also Barrett – in fact the latter is already in England. Petch’s wound is not serious but he had fever with a temperature of 106.6! Mace, Parsons and Buckley are also somewhere about and I daresay will get to London Hospitals. I hope Dad will go and call on any he hears about. Ashdowne has gone on leave – I meant to tell him to call on No 16 but forgot, perhaps he will do so in any case – a funny lad but a very good sort and “one as will stand by one”. We have an excellent H.Q. with a real porcelain bath and a carpet or two. It has been very interesting liberating civilians who have had the Boche since 1914. They are very pleased to see one, and so everything they can to be helpful – particularly to the wounded. The country looks very nice and the weather today has left nothing to be desired, so everything is excellent. I keep on dropping off to sleep as I write – so I must stop. We are now at rest and I hope in a day or so to be able to write a respectable letter – unless of course we are rushed off to battle “toute de suite”. I am no longer in Command, one Dyer Bennett having arrived. However, I was C.O. for 6 days including a battle or two which were very successful. I am now once more Adjutant – my proper job. Very fit and well, and hoping to get home soon. Have had extraordinary luck – Ashdowne, Banwell, Dennis and myself are the only officers who have been through whole of last fighting and two – B. and D. had slight wounds. One serious loss during last few days has been that most delightful little man the Doctor who was killed tying up a wounded man. Yesterday was the worst day, and yet the very best day I have ever had in this war – some time I will tell you all about it. Col. Wood should be back on Thursday, & then for LEAVE. I cannot quit here until there is someone at the wheel who knows all about the Btn. Many happy returns of today, meant to write on 2nd but could not. A table, a tent, and a candle – no great noises outside – fingernails which do not look as though mustard & cress might at any moment sprout up, and , above all, a chin not in the least like sand-paper, or a hearth-rug. It is true it is cold weather for tents, and there isn’t a house within miles, and none of the ordinary comforts are available, but sill we feel quite respectable. For the moment fighting is over. We have had three battles since the day I started to go home on leave, and heard rumours of coming war and so returned – way back on the 22nd. About our first I have told you, and the second is now history, or at least in the Daily Mail. Our part in it was important and the result excellent – casualties very slight except for the most unreplaceable Padre. He is a terrible loss as he did so much for us. Our third & last battle was also very successful though as a Btn we were only in support, had none of the fun & got most uncomfortably shelled. In this we had bad luck as we had our officers hit – not as a rule badly but still we lost one or two. First the Colonel got one in the arm. As Burnett had gone to England on a course this put me in command. Then Petch got one in the leg – then others. So until some of them return we are quite short. Who we shall get to Command us I don’t know. Col. Wood ought to be back very soon – and it is just possible that they may leave me in charge until he comes, I hope they will. If we have some one new I shall have to stay on until he gets settled in, so leave is still a little distant. In any case with Burnett away, and Griffiths wounded I am almost certain to be 2nd in Command until Christmas, so you may yet see me coming on leave as a full blooded Major! Ashdowne is my Adjutant at present and will I think do very well. The real help though at Btn. HQ. is the Doctor – little Jack – a true philosopher and friend unruffled by shells and war alarms and just the man for a very young C.O. taking over a Btn on the night of a battle and expecting to be counter-attacked. Someday I shall be able to tell you all my experiences, there is a lot to tell but I cannot tell it in a letter. What they will do with us now I don’t know – perhaps a rest – perhaps not. 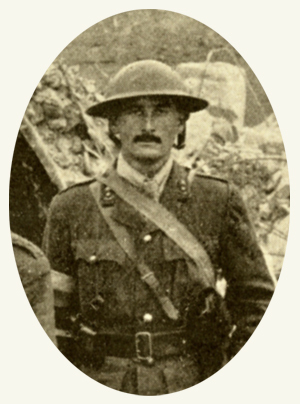 From 26 February 1915 to 26 November 1918, Captain J.D. Hills of the Leicestershire Regiment sent frequent letters home to his family. We publish the letters 100 years to the day after they were written. They give a unique insight in to how an individual coped with four years of war on the Western Front.